In May of this year, historically transgressive SF monthly Weird Tales launched a year-long tribute to one of its greatest writers, cosmic horror scribe Howard Phillips Lovecraft. Lovecraft's work fills a lengthy bibliography, and now it can fill the walls of your (no doubt sci-fi-themed) living room as well. 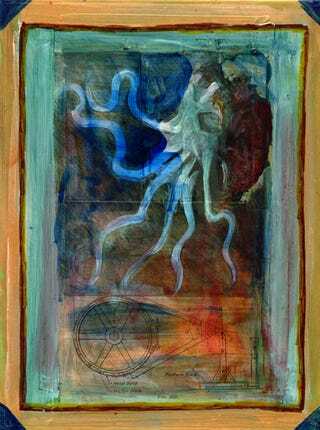 Inspired by the Cthulhu Mythos — the Lovecraftian universe of tales that focuses on the extraterrestrial deities who inhabit our world — artist Steven Archer is creating one painting a day for sale at the Weird Tales blog. So far he's had plenty of eerie, supernaturally lovely hits, and there are 235 days to go in the series Weird Tales is calling "Blasphemous Horrors. "My favorite of his creations is the above-pictured "Growth and Remission," but Archer (with Lovecraft up his sleeve) has so much more to showcase. Check out the thrilling images below, and then head over to WeirdTalesMagazine.com to see the rest. This is the sci-fi art gift that'll keep on giving 'till May 2009.